Baddiel's My Family: Not The Sitcom reminds us his mother was more than just wonderful. So is this show. 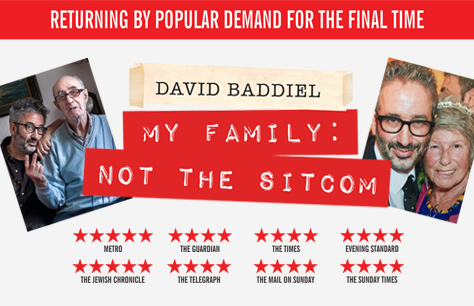 Following a critically acclaimed, complete sell-out run at the Menier Chocolate Factory, David Baddiel: My Family: Not The Sitcom comes to the Playhouse theatre! My Family: Not the Sitcom is a massively disrespectful celebration of the lives of David Baddiel’s late mother, Sarah, and dementia-ridden father, Colin. It’s a show about memory, ageing, infidelity, dysfunctional relatives, moral policing on social media, and gay cats. Come and be offended on David’s behalf. Book your tickets now or regret later! Excellent show. Funny, moving and very brave.